Besök webbplatser för några av de mest viktiga amerikanska striderna under första världskriget med en dagstur till Picardie-regionen i norra Frankrike. Avgår från Paris, resa till Aisne och Marnes historiska västfronten med en experthistorikerguide. Gå bland gräver i Belleau Woods och hedra fallna soldater vid Aisne-Marne American Cemetery. Läs mer om orsakerna och följderna av konflikten vid Museum of the Great War i Meaux. Städerna Aisne och Marne i norra Frankrikes Picardieregion var viktiga platser längs västfronten under första världskriget och platsen för flera viktiga allierade segrar, däribland Marne's första och andra slag. Din helgedagshistoriska turné börjar med morgonhämtning på ditt hotell i Paris och ca 1,5 timmars bilresa norrut i en bekväm minibuss. Besök den sprawling Aisne-Marne American Cemetery för att betala respekt för fallna trupper, många av dem amerikanska. Reflektera på den mänskliga kostnaden för kriget när du går längs rad på rad vita gravmarkörer och läser namnen på saknade amerikanska soldater vid Memorial Chapel, som byggdes ovanpå historiska stridsvagnar. På närliggande Belleau Wood kommer din historikerguide att dela berättelser från en av de krigens mest dödliga amerikanska strider, när amerikanska trupper kämpade för att förhindra tyska soldaters framsteg mot Paris. Ta en promenad genom de nu-serene skogen som fortfarande bär bevis på kriget, såsom grävningar, skalmarkeringar och förstörda strukturer. Stanna i Château-Thierry för att besöka Cote 204-monumentet som minns vänskap mellan USA och Frankrike och amerikanska styrkornas bidrag under kriget. Ta en paus till lunch på en lokal restaurang du väljer (egen kostnad). Fortsätt vidare till Meaux, där du kommer att dyka djupare in i WWI-historien vid Museum of the Great War. Läs mer om orsakerna, kostnaderna och resultaten av konflikten och bläddra bland mer än 50.000 krigstidartefakter. Koppla av och reflektera över returresa till Paris, där du kommer att släppas av på Opéra Garnier tidigt på kvällen. Nicola was very knowledgeable and a wonderful tour guide. She gave us in-depth knowledge of the areas we visited and provided great insight. We had lunch a wonderful spot that didn't have many tourists. We enjoyed our day very much and it was the highlight of our time in Paris. thank you! On August 1, 2018 my sister and I booked a tour of the 2nd Marne World War I battlefields with Nicola. Our goal was to follow in our grandfather's footsteps, an American soldier with the U.S. 4th Division, who was wounded twice during the 2nd Battle of the Marne. This was a private centennial tour and I cannot say enough good things about our tour guide Nicola. She was friendly and very knowledgeable about the military affairs of the First World War. She provided background and explained the causes of the conflict on the drive east from Paris. We visited Belleau Wood and walked through the lines of the U.S. Marines, paid our respects at a small British cemetery and the Aisne-Marne American Cemetery, grabbed a quick lunch at Chateau Thierry, and stopped at several war memorials and monuments. Nicola was well versed in the interpretations and answered all our questions. What was most important to us was to locate the positions where our grandfather fought and was wounded. Nicola was very flexible and joined our quest to go off the beaten track a bit and we were successful in finding the two areas where he was wounded. This meant so much to us. We finished the tour at the Museum of the Great War in Meaux. It was a very full and emotionally satisfying day and we have Nicola to thank. We give her our highest recommendation. Highly, highly recommend! 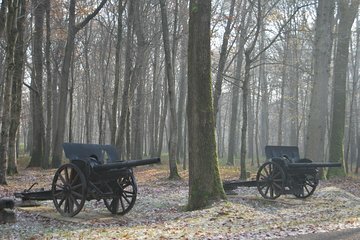 If you truly want to experience the battlefields of the War to End All Wars, a private tour is a must. We were apprehensive to pay private but must say we made the right and most rewarding choice1.This is a trip from the heart! my husband is a retired Marine it meant a lot to us. Our outstanding guide Nicolete was amazing and time was well worth it. He got the key, drank from the fountain, visited the Church, walk thru the Battlefield, and pay respect. History is beyond words, the trip itself is comfortable and the guide well knowledgeable. we got pickup at West Western Hotel and drop at the museum where we had an amazing time at the Museum of the Great War. Both my son and husband was a dream come true.. I will highly recommend it! Excellent trip. Guide was excellent and very knowledgeable. Walking in Belleau Wood was special. Visiting of the cemeteries for the four different countries was a nice touch. Wonderful tour and guide. If you can fit this tour into your stay, you will not be disappointed! Excellent tour by Bertrand, a very knowledgeable and helpful guide. May need to return to see other WW I sites in the future. Time well spent! This tour was amazing! My guide took me everywhere that I personally wanted to go to as well many hidden gems off the tourist track. Definite five stars from me. I would do this tour again in a heartbeat! Although Paris and its environs were experiencing singular nonseasonal flooding..our trip came off without a hitch. Bertrand is a warm, humorous, and VERY knowledgeable guide, not to mention an excellent driver. He was great with our 4.5 year old, too - not easy for most tour guides. My wife and son and I were joined by one other gentleman who was on his honeymoon, but took a day while his wife haunted the Champs d'l Eysess to see one of the most famous battlefields in U.S.Marines history....a perfect small group...which allowed a great deal of time to interact with Bertrand and learn from him. Belleau Wood is still filled with shallow trench lines and shell holes, and the monument to the AEF at Chateau-Thierry is spectacular. The day ended with two hours at the WWI museum, which has the largest collection of arms and uniforms in France. All in all, this was a wonderful day!